The pipe organ is referred to the King of Instruments for many reasons, and size is, of course, one of them. Pipe Organs are well known for their grandiose size and incredible range of tones and voices. But despite many organs filling entire churches or buildings, one pipe organ, in particular, can claim the title of “The World’s Largest Organ.” The Wanamaker Organ resides in Philadelphia and is truly a marvel of musical engineering. Today, Viscount Organs will look at this titanic pipe organ and its history. While it can be found in Philadelphia today, this massive organ was originally built for the 1904 St. Louis World’s Fair by the Los Angeles Art Organ Company. The original design called for the use of more than 10,000 pipes. The massive size naturally came with a massive price tag, and the builder went bankrupt during construction. Soon after the company declared bankruptcy, a merchant by the name of John Wanamaker agreed to buy the organ. Wanamaker owned a department store in Philadelphia and was an ardent advocate for the role of music in society. 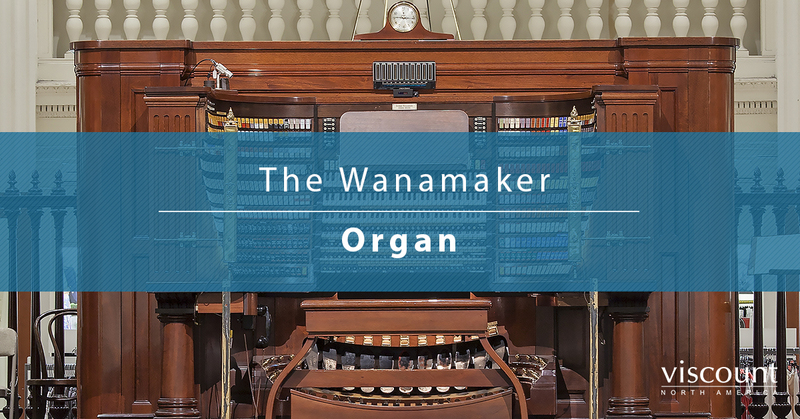 In 1909, Wanamaker bought the organ and had the parts shipped to his seven-story tall emporium. Over the course of two years, Wanamaker dramatically expanded the organ so that it would fill his entire store. In fact, his vision for the organ was so immense, that he had a factory built on site to create new parts and pieces for the organ. Between 1911 and 1930, 40 full-time employees worked non-stop to create and install an additional 18,000 pipes to the already huge pipe organ. Wanamaker brought in several famous contemporary organists to supervise the construction and offer input, including Marcel Dupré. The finished organ, even today, is truly a sight to behold. It weighs an impressive 287 tons. 28,500 pipes are fitted throughout the seven stories of the department store that houses it. There is an incredible variety of pipes of all sizes, the largest being more than 32 feet long, and the smallest being a miniscule quarter-inch long. Its console is made up of six ivory keyboards, 42-foot controls, 168 piston buttons, and 729 color-coded stop tablets. But the Wanamaker Organ is famous for more than just its size. Wanamaker was concerned with the quality of the organ as much as he was the quantity. The entire instrument is made from high-end materials and was crafted by master artisans. This instrument is a work of art in every sense. In 2006, Macy’s purchased the Wanamaker building and the organ in it. The department store continues to showcase the spectacular instrument, and it can be heard twice a day, six days a week. During the winter holiday season, additional shows are performed that celebrate the festive season. Over the course of its 100 years career, the Wanamaker has been played by a variety of accomplished organists, but only four have held the prestigious title of Grand Court Organist. The current Grand Court Organist has held this position for more than 25 years, and plays nearly year-round, only taking breaks to travel with other orchestras. The Wanamaker pipe organ truly has to be heard to be believed. It fills the entire department store with music and it can be heard clearly throughout all seven of the stories in the building. While many shoppers are undoubtedly drawn to Macy’s for the products they sell, many others are drawn to this Philadelphia department store to take in this immense instrument. No matter the size of your pipe organ, you too can produce immense sound thanks to Viscount Organ’s Physis® technology. Find a dealer near you to find out more.